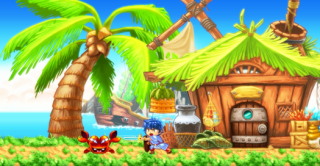 Announced back in February, Monster Boy is a spiritual successor of the ye olde Wonder Boy games. If you owned a Sega Mega Drive or Genesis in the '90s you probably played Wonder Boy in Monster World, a quaint platformer with some clever RPG and exploration elements. At least, that's how I remember it. Formerly known as Monster Boy and the Wizard of Booze, somewhere along the way studio Game Atelier changed the game's title to the comparatively safe '...and the Cursed Kingdom'. As you can see in the debut gameplay video above, the game features a variety of characters with different abilities, and the setting isn't too dissimilar to the aforementioned Monster World. According to the video, Monster Boy is due some time in 2016.